They are planned to be introduced in diesel form first when UK sales of the updated S-class get underway later this year. The revised Mercedes-Benz S-class introduces a new range of in-line six-cylinder engines – the first for the German car maker since it adopted V6 units back in 1997. The new in-line engines, which are set to find their way into other models, share their architecture with Mercedes’ existing range of four-cylinder engines and are planned to be introduced in diesel form first when UK sales of the updated S-class get underway later this year. 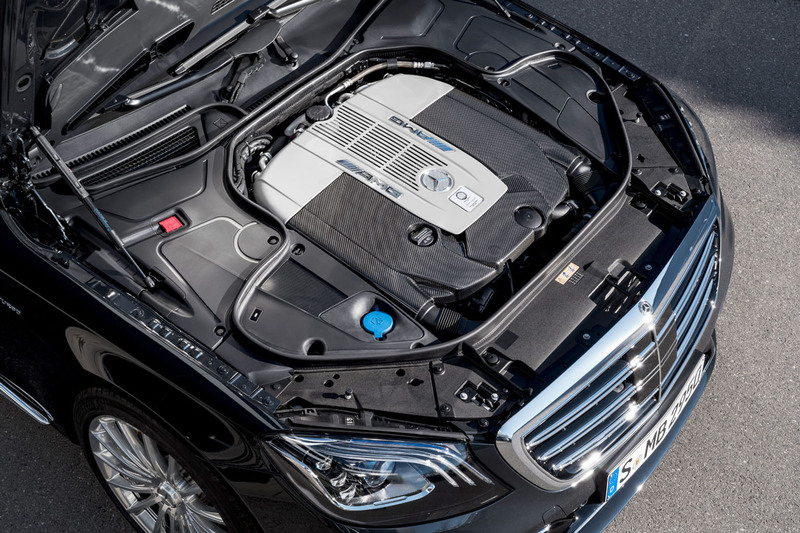 The heavily related petrol unit, which comes combined with a new 48-volt electric system that allows it to run both an electric booster compressor an integrated starter generator as part of a mild hybrid drivetrain strategy aimed at netting greater performance and reduced fuel consumption, is then set to follow in 2018, according to Mercedes. The line-up – yet to be confirmed for the UK - includes the S350d and S400d which both use the turbocharged 3.0-litre in-line six-cylinder diesel engine in two states of tune, and develop 207bhp and 336bhp respectively. 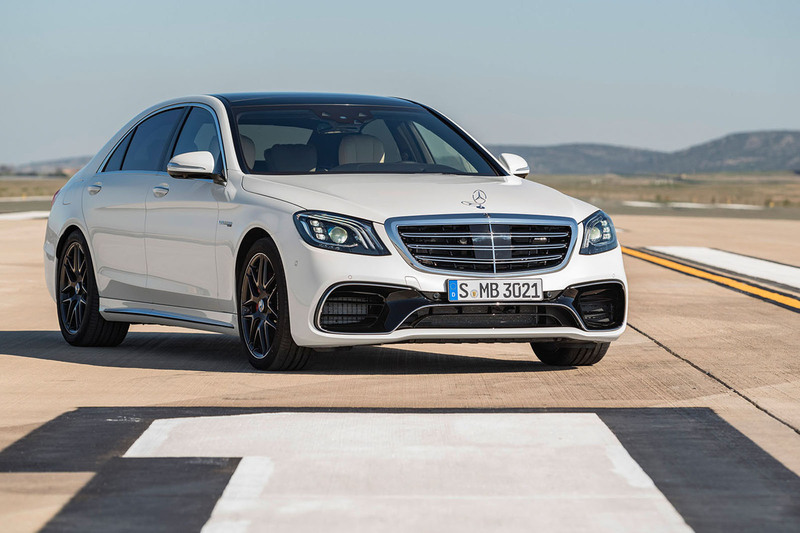 Also included in the launch line-up for the facelifted S-class is the S560 – a model which resurrects one of the most revered model designations ever used by Mercedes-Benz. It will use the twin-turbocharged 4.0-litre V8 petrol used in the existing S500. 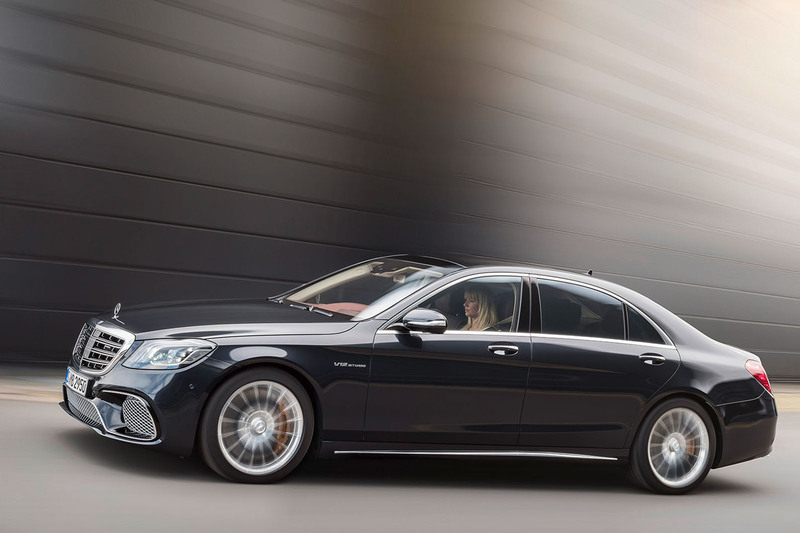 There will also be a S560e, which will replace the current S500e, which runs the turbocharged 3.0-litre in-line six-cylinder petrol engine with an electric booster compressor and an electric motor in combination with a 48 volt electric system. Further up the line-up, the updated S63 eschews the twin-turbocharged 5.5-litre V8 petrol engine of its predecessor for the most powerful iteration of AMG’s twin-turbocharged 4.0-litre V8 powerplant. Power has increased by 26bhp to 612bhp, with torque remaining the same as previously at 663lb ft. The performance saloon is set to hit 62mph from standstill in just 3.5sec, beating its predecessor by 0.5sec. The range-topping S65 continues to run a twin-turbocharged 6.0-litre V12 delivering 621bhp and stout 737lb ft of torque. Further models will be introduced in 2018, including replacements for the S300h, S400as well as the upmarket V12-powered S600 and S650 Maybach models. The facelifted S-class is visually distinguished by a series of subtle exterior styling changes, including new look grilles across the range, revised headlamps featuring a distinctive new three stripe LED day time running light graphic, re-profiled bumpers and altered crystal effect tail lamps. Inside, there are revised digital instrument and infotainment monitors offering the choice between classic, sporty and progressive themes, new touch sensitive controls for the infotainment system as well as revised cruise control system controls within a redesigned steering wheel, a wireless smart phone charging option and new LED lighting offering up to 64 different interior colour themes. 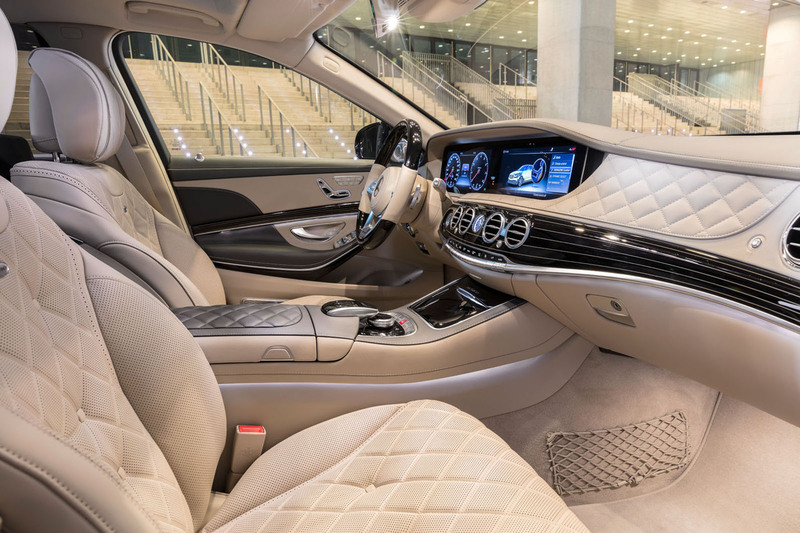 In a first, the new S-class also offers so- called energising comfort control – an new optional system that networks the air conditioning, fragrance feature, massaging seats, lighting and sound system to boost comfort and driver well- being across six programmes: freshness, warmth, vitality, joy, comfort and training. Further advances for the S-class saloon include an upgraded version Mercedes-Benz’s Magic Body Control system featuring the Curve function that tilts the body by nearly 3.0 degrees in corners – as already offered by the S-class Coupe. The LED headlamps have also been revised with a new optional ultra-range function that is claimed to offer main beam light intensity performance of over 1 lux for a distance of up to 650 metres. On sale in October, Mercedes UK is likely to ditch the entry-level SE trim as 80% of current sales are AMG Line. Prices will increase slightly over the entry-level AMG Line model, the 350d, which starts from £71,585. i see the photocopier at mercedes is still working. dont they realise half the point of buying an s class is so everyone knows youve got the flagship and not some c or e class? Even the S Class isn't impervious to the Middle East/Far East 'kitsch look'. This model always had a subdued classy look, now it also looks a dogs dinner like the rest of the range. Very disappointing. Plus this crazy numbering system just gets dafter....how can a 4 litre petrol be a 560...or even worse a 3 litre diesel be a 560 just because it has a battery for an electric motor. Even the 630 isn't safe.....its a 4 litre....go figure! Like BMW, Mercedes is naming many of their cars as if they still have the equivalent naturally aspirated engines. So the power output of this tune of 4.0 litre turbo engine in the S560 would be equivalent to a current 5.6 litre N/A engine. Of course Mercedes could have named this particular model S400 or S400T but I suppose this would be seen as a step back in terms of name as there is more kudos with a larger number, especially as historically BMWs and Mercedes have generally always has large capacity engines in their models. Or maybe they just think of a number, the same engines have different numbers in different markets, a 25 is a 28 depending on where it is sold. And there are others the only logic is marketing, otherwise they'd number them by the KW. Now we have to contend with design fatigue of Uber-Klasse proportions for such a zoot suit class transportation cocoon. As the only tech item worth mentioning though, i do fancy the 'banking feature' round curves....a bit like driving one's personal Alstom's mercurial AGV! Otherwise, bow down to the king. In addition to freshness, warmth, vitality, joy, comfort and training, can we also have tart's boudoir? That front-end is truly hideous - probably reflects the oligarch/thug who'll buy one. The styling is more than a touch overblown inside and out.